There are countless people watching movies every day, but watching movies on iPhone iPad with the help of a movie streaming app seems to be a wiser way to save time, money, energy and CPU occupation, etc. Air Playit is a free iPhone iPad movie streaming app for streaming movies to iPhone iPad without conversion and sync. iPhone iPad can not play 1080p videos and just support part of 720p videos because of incompatible videos formats. To watch 1080p/720p videos, we need to convert these videos, then sync with iTunes. If you want to instantly watch these videos without conversion, streaming 720p/1080p videos with Air Playit is the most sensible choice. Do you want to play music on iPhone iPad at anywhere without sync? 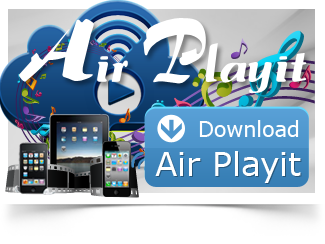 Air Playit, a free audio streaming software will help you stream music to iPhone iPad via WiFi/3G/4G network. No syncing required. Air Playit will help you streaming video audio to TV via iPhone iPad iPod touch and watching videos on a big screen. How to realize this? Here is your guide. Have you ever wished you could enjoy the music and videos stored on your computer while you're out? Now a brand new way is coming out, it is the time to forget about copying all your media from your computer to portable devices for watching and sharing. Want to build your home video library with video streaming server? With built-in HTTP server, Air Playit comes with the ability for seamless access to video and music playlist from any web browser. Thus you can take advantage of VLC and Apple QuickTime Player to play the streaming video easily. Air Playit acts as a remote video converter software. With the built-in offline task manager, you can add and manage video conversion tasks on your iPhone iPad, and download the videos to your devices via WiFi. Wouldn't it be nicer if you could simply stream any video file like AVI,WMV, MKV etc from your Mac or PC and have it play back instantly on your iPhone or iPad anywhere and anytime? Good news, then, that there is a solid option to accomplish this handy trick. Here I will introduce you a more efficient way to watch AVI video on iPhone iPad by using Air Playit. Air Playit is a free video streaming software which is specialized in streaming videos audios to iPhone, iPad, iPod touch from PC & Mac without the third-party converting software and iTunes. Generally, when you want to play WMV AVI MPEG on iPhone iPad, you have to wait until the whole video is converted and sync it to the device. Now Air Playit sets you free, just click and play WMV AVI MPEG on your iPhone or iPad immediately. Watch video on iPhone should not so bothering. Just find a free iPhone App that can let you watch the PC or Mac downloaded video on your iPhone without sync. Here I will recommend you for the newly-released free video streaming App - Air Playit.